Woofy Cabs Per Kilometer Scheme in Delhi NCR. Pet Travel Per Kilometer Scheme For Your Furry Companions includes. ( For Ex If Traveled 15 Kms= 200+ 20 *35= 900/- shall be charged ). 4. 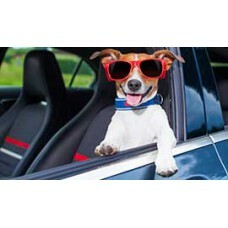 Two Family Members Can Travel With The Furry Companion In Woofy Cabs. 5. Mini Commercial AC Cars Are Available. 6. Well Behaved Drivers (Pet Friendly). 8. Waiting Charge On Per Minute Basis Starts If The Cab Is Kept Waiting Beyond 5 Minutes Including Heavy Traffic Conditions). 9. In Case The Cab Is Sullied By The Furry Companion Dry-Clean Charges Rs 500/- Payable Extra Over And Above The Entire Journey Fare.